Myanmar is a fast-growing rice producer and may soon play a major role in the global rice market. The Myanmar government and its agriculture arm was represented from the regional down to township levels during the planning for the project's rice component. IRRI rodent expert and Irrigated Rice Research Consortium (IRRC) coordinator Grant Singleton leads the new project with the strong involvement of other IRRI scientists. Dr. Singleton, along with IRRI scientists David Johnson and Madonna Casimero, visited two project sites and held dialogues with farmer groups. 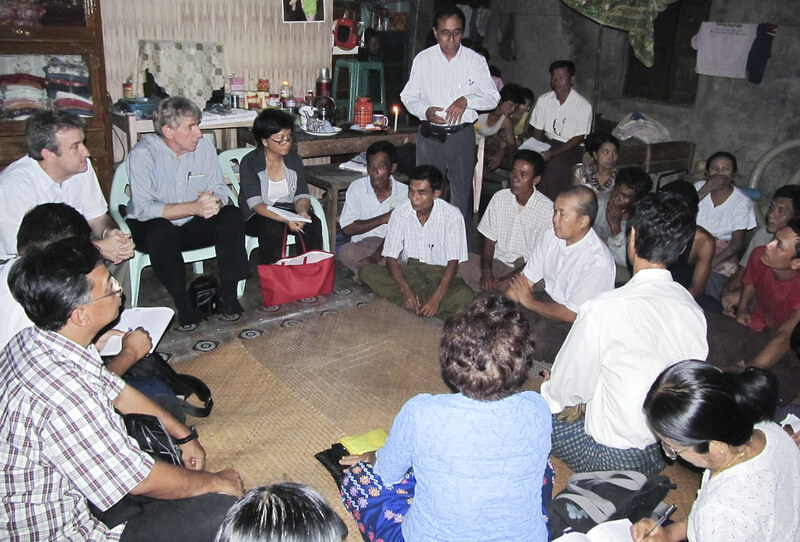 Dr. Casimero, now based in Myanmar, will oversee the adaptive research trials on natural resource management practices. Dr. Johnson will lend his expertise on crop establishment options and weed management. Martin Gummert, IRRI postharvest specialist, will lead the development of best management practices to reduce postharvest losses in both cropping systems. Dr. Singleton reported on the project’s overview, progress, workplans, and objectives during the inception meeting of the ACIAR Myanmar program on 14-16 November in Yangon. IRRC communication specialist Trina Mendoza was invited to present experiences with farmer participatory videos in Sulawesi, Indonesia, as a tool for monitoring and evaluation of research outcomes.